Italy and Spain have both been hit hard by the global economic slowdown. Spain and Italy have announced plans worth billions of euros to kick-start their economies. 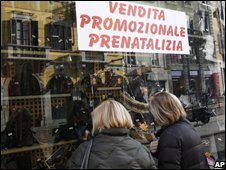 Italy approved an 80bn euro ($102bn;£66bn) emergency package that included tax breaks for poorer families, public works projects and mortgage relief. Spain unveiled an 11bn euro plan aimed at creating 300,000 jobs. The announcements are the latest in a series of attempts by EU governments to shore up their economies as the financial crisis bites. Italian Prime Minister Silvio Berlusconi called on to Italians to keep on spending. "We have helped citizens, the less well off, so that they can continue to consume," he said. "The intensity and duration of the crisis depends on all of us." Spain's Prime Minister, Jose Luis Rodriguez Zapatero, said the money will be mainly invested in infrastructure and public works. Spain's unemployment reached 12.8% in October - the highest in the eurozone. The Spanish government said it would invest 0.8bn euros in the ailing car industry, which has been through a severe downturn and seen sales plummet 54.6% since the beginning of the year. The construction industry has also been severely hit by the financial crisis, with property prices falling and companies slashing thousands of jobs. The Spanish economy shrank by 0.2% in the third quarter, putting an end to 15 years of continuous growth. The European Commission has demanded that each EU member must spend about 1.2% of Gross Domestic Product (GDP), or economic output, to fight the economic slowdown. Spain's plan is worth 1.1% of its GDP. Germany launched a similar 50bn euro package, while next week France is expected to unveil economic measures worth 20bn euros.